The background on these four is very common place here in WV. 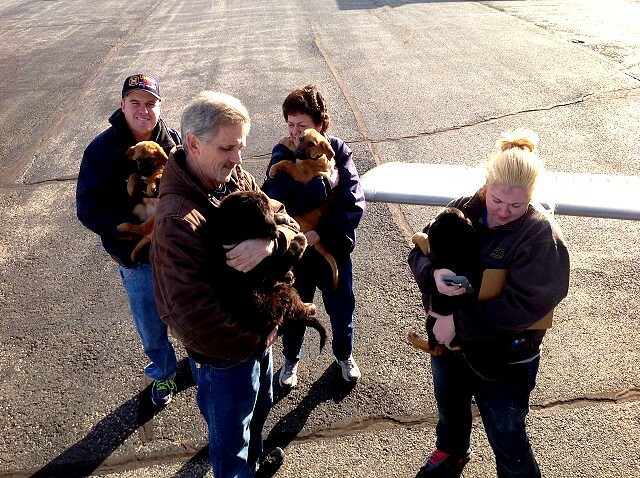 Six puppies, around 2-3 months old, were brought to the Humane Society of Raleigh County on 12/10/14 by someone who said they found them. They did not look like they were feeling well, so they were taken to the vet. There they were diagnosed with parvo. They were given the best care possible, but unfortunately two died. I received a text from Elizabeth Raney of Operation Underdog on 12/31/14, asking if we could foster the remaining four. I contacted Pam Romansic at HSRC, but being a holiday weekend, the vet closed early and my husband was not able to pick them up until 1/2/15. When he brought them home, they were skinny, scared, and dirty, but they were alive. And in the true spirit of dogs, they were playful after getting out in the yard. Dinner was the second agenda, then playing, exploring, and eventually sleep. 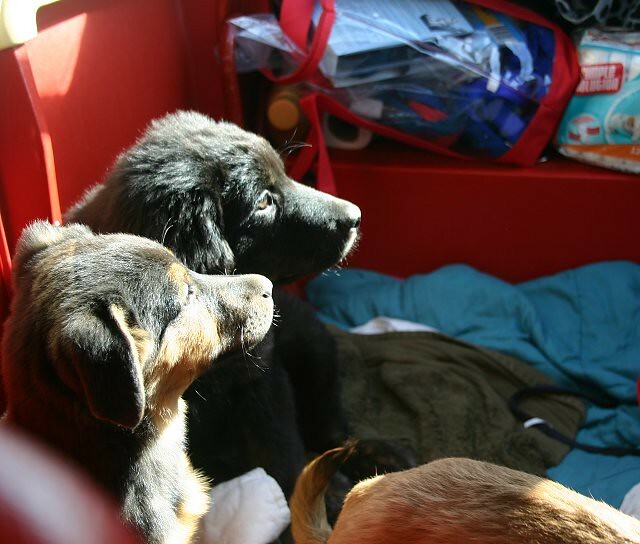 We kept them in a kennel surrounded by a tarp, with heated dog houses and water bowl while we worked. Every evening when we came home, there were 8 little paws up on the fence barking. They knew the drill. Dinner, then yard time! As it became too cold for them to stay outside, we brought them in. They stayed in a bedroom with a crate (which stayed open), and a puppy pen. Lindy was the first to figure out how to escape the pen, followed soon by Puffy. Dudley and Casey never quite figured it out. Puffy is the one who would be standing in the background away from us while the others were climbing for attention. It seemed as if he were studying us, always a thoughtful look in his eyes like he was on a different level than the others and understood more. He loved being petted, but did not like being held. He would tolerate it, but preferred to just sit beside you. And yeah, he was a toy hoarder. Any toy he found, he took to the crate. Dudley is just your average hound. He loved to play, got along with everyone, and wanted to be loved on. He was content to just sit in your lap or beside you, either way was good for him. Lindy was the runt and the one that always wanted to be in your lap. She loved to snuggle around your neck and was the first to put paws around my neck for a hug. It was such a pleasure to foster these four and am extremely grateful they made it thru the parvo to find rescue with Joe Joe's Place. I am also extremely proud to volunteer with such an amazing shelter such as HSRC, who became no-kill approximately 2 1/2 years ago. This is due largely in part to a group of awesome ladies known as Operation Underdog, a rescue that works with getting dogs and kittens out of the shelter and into rescues. 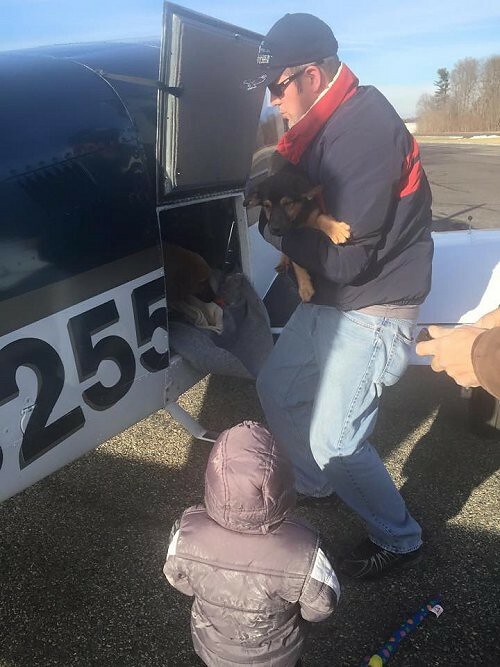 And a big thanks to Pilots and Paws, who have transported for us and we are extremely grateful. Operation Underdog says that it takes a village to save a dog, and it most truly does. The cooperation of so many on so many levels saves lives, and my husband and I are proud to be a small part of this huge village. 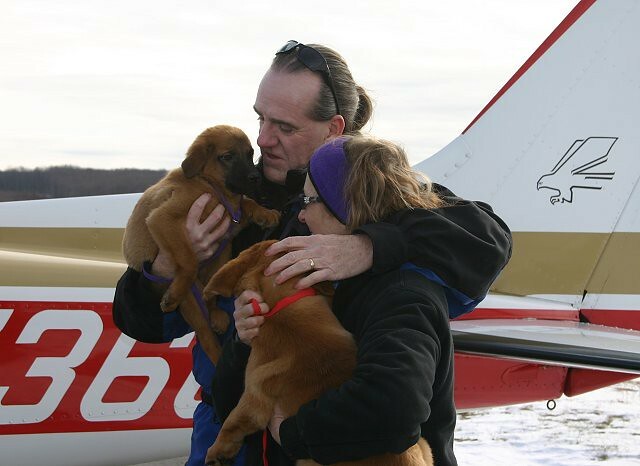 Donna and Mark say goodbye to their fosters. Our world really needs more people like this, people who open their hearts and homes to truly defenseless little souls. All our precious cargo is loaded up and ready to begin the grand adventure to NJ. Team Mutt Muffs John and Michele. We're ready to begin leg 1, which will send four little fur balls on their way to new homes. 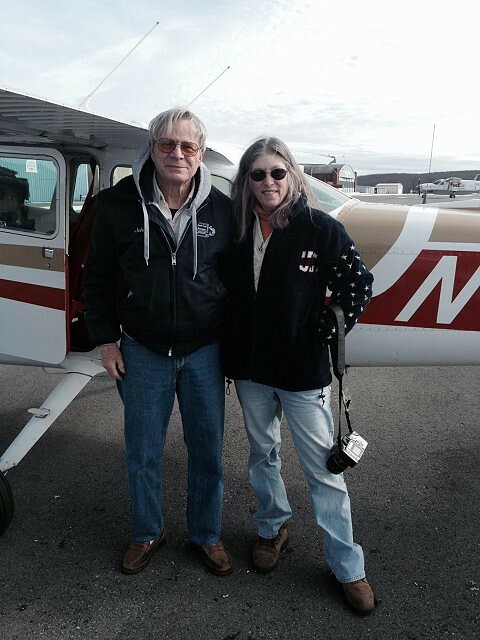 Though it was cold as heck, we had beautiful clear weather and a smooth flight over the WV mountains, then arrived safely at KDMW, Westminster, MD. Leg 2 pilot, Gary, was waiting for us. 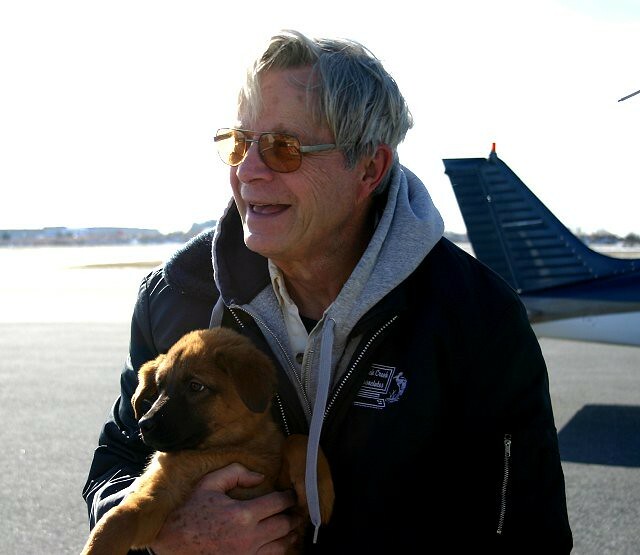 Pilot Gary flew the gang to New Jersey, and unloads the now well-traveled puppies under the close supervision of someone who REALLY REALLY REALLY wants to hold a puppy! All four lovelies are now in the caring hands of volunteers at Joe Joe's Place. A new year brings a new chance for these guys. New families can't be far behind.